Guests will feel right at home from the moment they walk inside this historic Bermagui Accommodation. Built in 1895, the Bermagui Beach Hotel has the relaxed ambience of a country hotel that oozes charm and comfort. Located in the heart of town, it stands across the road from Horseshoe Bay and is moments from local landmarks, the Blue Pool and the Fishermen’s Wharf. This Bermagui Accommodation has 18 rooms and three different room categories, there are accommodation options to suit all guests’ needs. Bunkhouse rooms are perfect for budget travellers wanting basic accommodation, they include shared bathroom access, towels, and linen. The Motel rooms and Hotel suites all have ensuite bathrooms, televisions, toiletries, mini fridges, towels, linen and free wifi. The Hotel bistro is known as ‘Palm Bar’ is popular with locals and visitors, and has a reputation for offering fresh, quality meals. The Palm Bar is family friendly and is perfect for groups large or small. 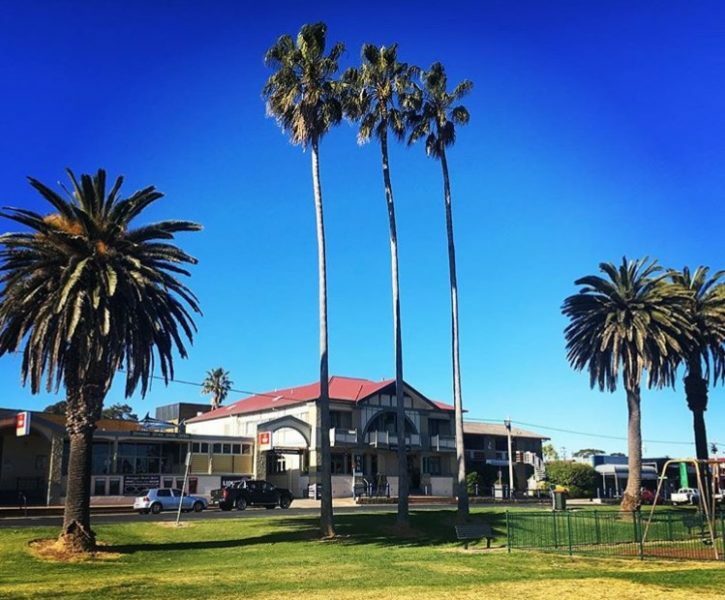 Bermagui Beach Hotel has entertainment on offer for locals and guests, with live music on the weekends. During late September and late November, the hotel is a popular spot for whale watching. The Bermagui Beach Hotel is at the heart of it all. With black marlin and yellowfin tuna, Bermagui’s deep blue waters are great for game fishing. Join a fishing tour to the best ocean locations. Wallaga Lake is popular for fishing, too. You can savour fresh seafood dining by the water at Bermagui Fishermen’s Wharf. A beautiful Sapphire Coast town, Bermagui is famous for deep-sea game fishing. With the continental shelf only 20 km offshore, discover the thrill of game fishing in the deep blue waters for black marlin and yellowfin tuna on fishing charters that depart from Bermagui Harbour. Bermagui Beach Hotel is located a 5-hour drive south of Sydney via the A1, in the Bega district of NSW. Its makes an ideal stop off point if driving to Melbourne along the coastal route. > Bermagui Beach Hotel is located right across the road from the beach and a short stroll from local attractions such as the Blue Pool and Fishermans Wharf. > Blue Pool is a popular attraction among locals and visitors. It is natural rock pool on the edge of an ocean cliff that has been well maintained. It is clean and fresh making it the perfect area for snorkelling. Guests will often spend the whole day there and usually pack food or a picnic hamper. > Bermagui Fisherman’s Wharf is located in the heart of Bermagui and offers a range of restaurants, wine bars, and cafe’s. It is a great place to visit local shops, eat a variety of delicious seafood and enjoy the beautiful views of the harbour. At night, dining on the upper verandah is amazingly beautiful and is a must when visiting the Fisherman’s Wharf. > Bermagui is close to the popular diving spot, Montague Island, with its colony of fur seals and lighthouse. A day trip is highly recommended.